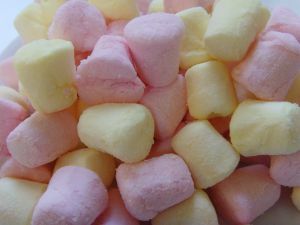 Marshmallow mosaic: Mini marshmallows now come in colors. Glue the marshmallows to a paper plate to create a mosaic of an animal, person, or an object. If you don't have the color you want, you can paint the marshmallows or dye them with food coloring. Marshmallow rainbow: Just like the marshmallow mosaic, you can make a rainbow. Line up the different colored marshmallows so that they form an upside down U on your paper plate. Place like colors underneath of each other so that the first upside down U would be made up of green marshmallows, the one underneath of it yellow, etc. You can even form the appearance of clouds at the bottom of the rainbow with white marshmallows. Marshmallow igloo: Turn a Styrofoam cup upside down. Cut a small upside down U out of the side of the cup near the bottom to form an entrance into the igloo. Glue one mini marshmallow at a time on to the outside of the cup so the mini marshmallows resemble blocks of ice. Regular school glue should work for this craft. Marshmallow snowman: Connect three large white marshmallows with a toothpick. This is the base of your snowman. Decorate the snowman with paint, other pieces of candy, or any fabric scraps that you may have laying around the house.